Are you trying to get yourself in shape for the academy? Are you all ready on the force and need to regain your fitness to be at peak performance on the job? Attention all firefighter applicants! The state of RI will be holding a new agility test soon. Peter Vieira is a Providence Firefighter who has taken this test. Pete has the knowledge and the experience to help anyone who is planning to take it. Pete is a former Firefighter Combat Challenge competitor and a certified Russian Kettlebell Instructor who can take you to the level you will need to be at to pass this test. Are you trying to get yourself in shape for the academy? If this is you, this is exactly what you’ve been looking for. 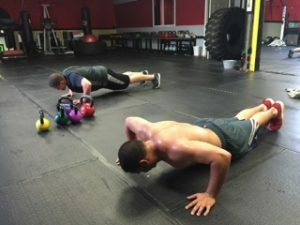 At Body Armour Fitness we specialize in transforming bodies through dynamic training with Russian Kettlebells and unorthodox training techniques that you can’t replicate at your current gym. At Body Armour Fitness, we combine kettlebells, strong man training, martial arts, heavy bags and much more.